Federal Minister of Education and Research honoured the winners of the "Green Talents" international sustainability award, when they visited Germany from 1 November to 11 November 2010. 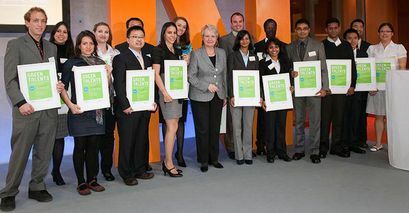 On 2 November 2010, then German Federal Minister of Education and Research Professor Annette Schavan honoured the winners of the Green Talents international sustainability award for their research. 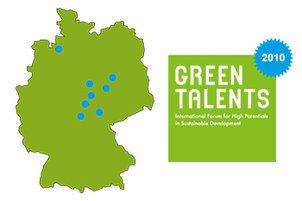 She received the 20 award winners of 2010 at the 7th BMBF Forum for Sustainability (FONA) in Berlin. "We are extremely pleased about the great response the Green Talents Competition once again received this year and about the participants' interest in Germany as a research location," said Minister Professor Annette Schavan during the Green Talents award ceremony at the FONA Forum. "The purpose of this competition is to advance international cooperation so we can jointly contribute towards developing sustainable solutions to fighting the climate change and to protect the environment." Minister Schavan pointed out: "We create conditions that let us learn with and from one another. Most importantly, we do not want to make decisions over the heads of the young people themselves whose future is the issue here, but together with them." The award of the Federal Ministry of Education and Research (BMBF) under the patronage of Minister Professor Annette Schavan was handed out for the second time in 2010. It is a distinction for outstanding scientific talents in the field of sustainability research. The decisive selection criterion is that the applicants' research may crucially contribute towards mastering global challenges such as the climate change, declining energy resources and massive environmental pollution. A total of 234 young scientists from 57 countries had applied to become one of the "Green Talents". A high-calibre jury of German experts selected a total of 20 award winners who traveled through Germany from 1 to 11 November 2010 as part of a ten-day Science Forum. Germany is one of the leading locations for sustainability research in the world and a strong partner for international cooperation arrangements in this field. During their stay in Germany, the "Green Talents" visited important universities, research institutions and companies and learned about trend-setting projects in various fields of technology. They met renowned German experts and established contacts with young German scientists. 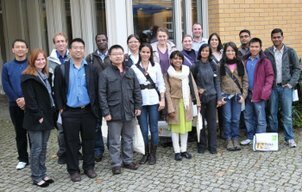 During the "Green Talents Forum" taking place from 1 November to 11 November 2010, the winners visited German universities, research institutes and companies and got to know exemplary projects from different fields of sustainable development. You can find more information as well as the video diaries in the station portraits below. more: Science Forum 2010.